"The World Keeps Not Running Out of Oil" | Watts Up With That? "The World Keeps Not Running Out of Oil"
The world has anticipated the “rapid exhaustion” of crude oil supplies for at least 100 years. Will it go on being close to running out of crude for the next 100? “Peak Oil” — the idea that global oil production will soon reach a maximum and then begin to decline — attracted a significant number of believers in the 1990s and early 2000s. Unconventional resource production blossomed in the United States. With rising crude production, the U.S. stopped soaking up the world’s excess oil supply. Instead of cutting back crude production to balance the market, Saudi Arabia increased production to protect its market share. And ta-da! — we got a global glut of crude and liquids, along with a truly major price collapse. Today, you are more likely to hear people talk about a possible worldwide peak in oil demand rather than a peak in oil production. But the principal arguments for Peak Oil haven’t changed much. The concept of Peak Oil developed from a theory put forth by American geoscientist M. King Hubbert. Based on overall reserve estimates and the pattern and history of field discoveries in the United States, Hubbert created a composite, mega-decline curve that predicted U.S. crude oil production would peak in the 1965-70 time period. And U.S. oil production did reach a peak, a little later than the original Hubbert curve predicted. But with the discovery of North Slope oil in Alaska, production began to increase again. The domestic Peak Oil estimate was re-labeled as a Lower 48 prediction. Now, it appears that Hubbert’s approach predicts a profile for conventional oil production in a defined geographic area, when technological development and oil prices remain within limited bounds. Breakthroughs in technology, especially horizontal drilling plus hydraulic fracturing — call it “hydrozontal development” — combined with today’s improved exploration and production tools have reversed the U.S. oil production decline. In its June energy outlook, the U.S. Energy Information Agency forecast that U.S. crude production will reach an all-time high of more than 10 million barrels per day (b/d) in 2018, along with 4.19 million b/d of natural gas liquids and 1.02 million b/d of ethanol. Instead of Peak Oil, the world has gotten a peek at a new energy future. Hubbert’s original 1956 paper can be accessed here. Hubbert fits the growth and decay of oil production to a logistic function (Hubbert Math). EI 330’s first peak occurs at roughly the half-way point in the extraction of the first 250 million barrels of oil. Old fields, particularly large old fields, will often exhibit multiple secondary production peaks. 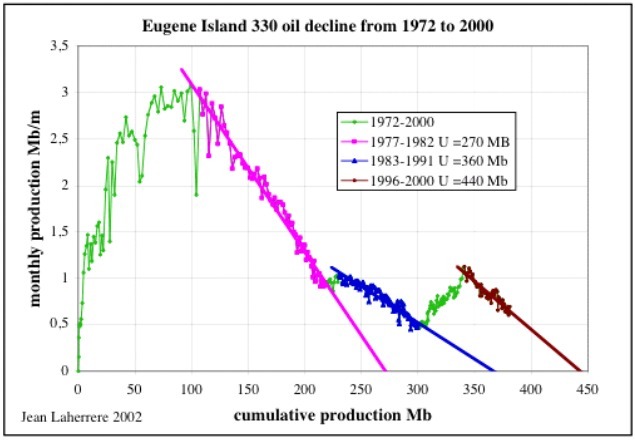 In the case of Eugene Island 330, the secondary peaks were due to a combination of well recompletions, sidetracks and limited recharge of some of the reservoirs (No, this is not evidence of abiotic oil). Hubbert’s fame in peak oil circles comes primarily from the assertion that he accurately predicted the 1970 U.S. peak. Because of this prediction, Hubbert is widely-regarded among peak oil adherents as a visionary. He has been called an oracle and a prophet. A recently published article — What Hubbert And Pickens Got Right About Oil, And What’s Next — recounts the uncanny accuracy of his prediction. The truth, however, is much more nuanced. Hubbert got a lot of things tremendously wrong, and his much-heralded 1970 prediction contains a large caveat of which most people are entirely unaware. Here is what his 1956 paper actually stated. As shown in the illustration, Hubbert projected a U.S. oil production peak in 1965 at an annual production rate of about 2.8 billion barrels, or 7.7 million barrels per day (bpd). However, note that there is another curve rising above and extending beyond the 1965 peak. 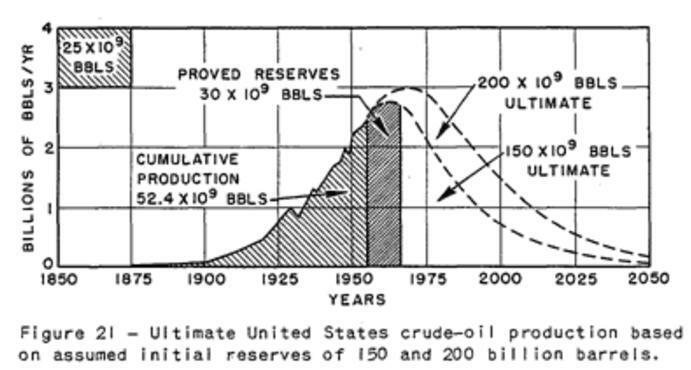 This was Hubbert’s “contingency case.” He calculated that if the U.S. oil reserve was 200 billion barrels, peak production would occur in 1970, a delay of five years from his base case. However, he indicated skepticism about the reserve being that high, noting that this would imply “an amount equal to eight East Texas oil fields” beyond the 150 billion barrel estimate. Nevertheless, if the U.S. reserve was as high as 200 billion barrels Hubbert estimated a 1970 U.S. oil production peak at 3 billion barrels, or 8.2 million bpd. Oil production in the U.S. did in fact peak in 1970, albeit at 9.6 million bpd. While Hubbert’s prediction was in the ballpark, those who cite him don’t seem to be aware that his “perfect” 1970 prediction was based on a secondary case about which he expressed skepticism, and it was about 15% too low on the production rate. Hubbert’s base case — a prediction made in 1956 of a 1965 peak — was off by 5 years and was 20% too low . Or to put it another way, his base case at that time was that U.S. oil production would peak in 9 years, but it actually peaked after 14 years and at 15% higher production than projected. My point here is to address his oil production predictions based on what he actually wrote. Still, as someone who frequently makes predictions, I will say that his predictions about U.S. oil production were pretty good. They weren’t prophetic, or nearly as exact as many peak oil adherents claim. But they were in the ballpark. Yet when we look at what he had to say about global production and natural gas production, his predictions were way off the mark. He arrived at an estimate of the ultimate conventional oil production of the world by comparing a number of estimates. He settled on an estimate of 1.25 trillion barrels for the ultimate potential conventional oil production. We now know that this estimate was far too low. But based on this estimate, Hubbert projected that the global peak in crude oil production would occur around the year 2000 at 34 million bpd . In reality, crude oil production in 2000 was more than twice as high at about 75 million bpd. Further, while conventional crude oil production did flatten around 2005, more than a decade later there is no evidence that it has begun to decline. (Overall global production has continued to grow, primarily because of the rise of shale oil production). So this was a big miss. Hubbert’s defenders will argue that he only really missed the date of the conventional crude oil peak by 5 years. But, his methodology specifies a peak and decline. That is not what we have seen. In fact, until conventional crude begins to decline in earnest we really don’t know how far off the mark his peak 2000 prediction may be. Hubbert simply underestimated the total volume of recoverable oil (past production + proved reserves + future discoveries). Figure 3. Hubbert Curve, US. with 2014 production, reserves and undiscovered estimate. If we assume that U.S. proved oil reserves and the undiscovered recoverable resource stopped growing, the Hubbert “peak” for the U.S. would have occurred in 2004. Bear in mind that the Hubbert curve is not meant to be an exact fit to the data. “Hubbert math” fits the data to the curve. The “Hubbert peak” would have occurred in between the two actual peaks in the data. An alternative approach would be to break the production down into two phases, with two separate logistic functions. Either way, if proved reserves and the estimated undiscovered recoverable resource stopped growing, we would currently be in the neighborhood of Peak Oil. 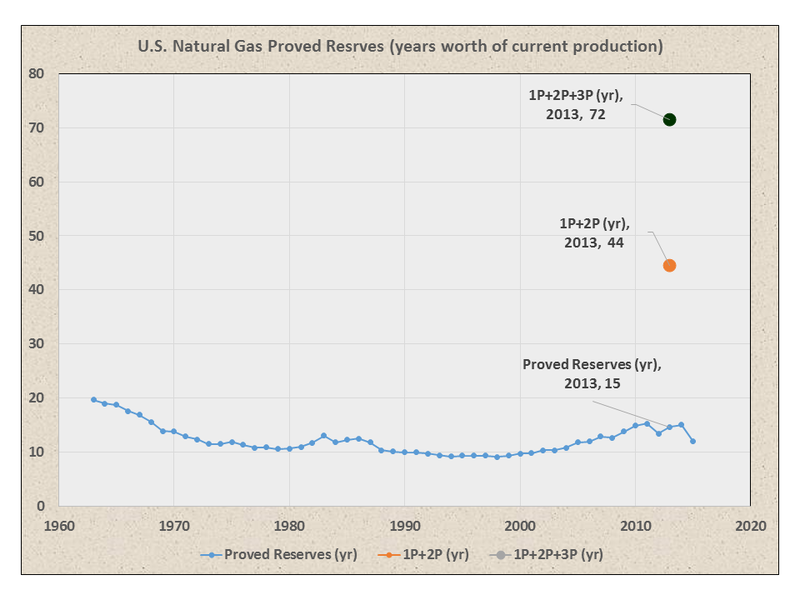 Since proved reserves will likely continue to grow over time and the total undiscovered resource is unlikely to contract, Peak Oil will likely remain just over the horizon for the foreseeable future. So, the answer is a qualified “yes.” People who fail to grasp the concept of Peak Oil will continue to anticipate the “rapid exhaustion” of crude oil for many years to come. In the interest of full disclosure: I have been employed in the U.S. oil industry as a geophysicist/geologist since 1981, with a six-year exile into management. I have always worked for “little oil” (as opposed to BIG OIL). I am a member of the American Association of Petroleum Geologists (AAPG), Society of Exploration Geophysicists (SEG) and Houston Geological Society (HGS). Despite my penchant for ridiculing greenschist, green is actually my favorite color… Oil is colored green on maps and well logs. Peak Oil is real but not really very relevant, abiotic oil is possible (despite a total lack of evidence for it) and is also irrelevant. Neither the reality of Peak Oil nor the lack of evidence of abiotic oil are part of a conspiracy to keep oil prices high. If it was, it would be a pretty p!$$ poor conspiracy because oil prices have been low for most of my career. And, no, ExxonMobil is not hiding the secret formula for turning (fill in the blank) into oil… But they did know all about Gorebal Warming waaay before Al Gore invented it… They knew it was wrong. As usual any and all sarcasm was purely intentional… Except for the bit about Gorebal Warming. July 10, 2017 in petroleum. Indeed. I remember as a kid that we were going to run out of oil by the year 2000, and had to switch to alternate fuels NOW before it was too late. In the real world, demand for oil is about to collapse thanks to telepresense, local manufacturing, and similar technologies that eliminate the need to ship people and goods around the planet. Telepresence yes. Local manufacturing no. In a few decades, all manufacturing will be local because there’ll be no other choice. If you’re living on an asteroid, you’re not going to spend millions of dollars to ship $10 worth of spare parts from Earth, and, if it was for an essential system, you’d probably be dead before they arrived. There might be a market for shipping raw materials around, but it’s more likely that people will simply live where the raw materials are. With the help of Präs. Trump für the US-based-manufacturer a good goal……..
MarkG, disagree. Raw materials for what, exactly? There are very few, if any, places on Earth that have all materials needed to manufacture anything in its entirety. Different locations, different resources. That’s why trade routes were established millennia ago and still exist. All predictions for “in a few decades” are rubbish. Yours seem particularly so. I think MarkG is referring to the local manufacture of artisan cheeses, craft beers and tourist trinkets. He seems to have little understanding of how the industrial world works. Is this Griff–on another email? MarkG, complete and utter BS. There is absolutely nothing on the horizon that is going to cause much of an increase in shipping costs, and many things that could bring shipping costs down. What effects costs of shipping most is governmental regulations and political jiggery pokerie in the guise of “environmentalism”. Did all of you miss the “living on an asteroid” and “ship…from Earth” parts of MarkG’s comment? Communications may reduce the need for personal business travel, however, there will always be a need to ship goods around the world. Local manufacturing will never be creating the same goods everywhere. There is no economy of scale to justify making 100 cars , or any other large durable good for the nearby town in a “local” factory. There is no economy of scale to justify making 100 cars , or any other large durable good for the nearby town in a “local” factory. When nanotech assemblers get going that stuff will also get made anywhere the base materials are available, much like a 3d printer can currently print a model anywhere. Micro6500, I am rather deeply involved in deposition manufacturing (AKA 3-D printing). I can say with near certainty that this technology is VERY FAR from mass manufacturing or making any durable components let alone assemblies. Anyone who thinks they are competitive has no knowledge of what large scale manufacturing is. True many small parts can be made, yet the engineering quality of these parts leaves much to be desired, and the fabrication rate is incredibly slow. The material strength is poor at best, and no matter the hype, metallic components are far from useful. Yes they can “grow” many parts to make a gun, yet I would not want to be near the thing when it gets tested. The quality of sintered metallic parts is well below that of poor sand castings. Durable….not so much. Where large scale machine tooling can stamp-out fender after fender and frame after frame the lowly 3-d printer is still “printing” the “scaffolding” needed to support the part it eventually will grow. Give them a few decades and there will be inroads for plastic components made using this method, however the costs had better come down drastically. They may supply parts to an assembly line, but they will never become an assembly line. Even if we assume that all of the material limitations with additive manufacturing can be fixed (they probably can), it will still be a niche application for customized, low run-rate parts. You simply can’t beat stamping, molding, or forging standard parts for high volume applications. 3d printed metal parts, suitable for both small scale and small volume manufacturing. Nowish, as no one as build a factory full of them yet, and even starting now would take a few years. I still forecast LENR (aka cold fusion) will have two major demonstrations this year. Rossi’s QuarkX and BLP’s SunCell. That at least one of those will become commercial in 2018. That’s not likely. Those two have promised commercial deliveries “next year” for several years. Actually, in the real world, most of the world “exported” their manufacturing capacity to China. It took a few decades, but it is more or less now complete. China now has the critical mass to produce everything. They have a large and growing domestic market which can bootstrap consumption as well as the entire world as their export market. Ever larger container ships lower the cost per unit for freight. Idiotic governmental agreements have done even more. It is cheaper to ship a small package (called an E-Packet) from China to the United States than it is to ship from inside one state to my neighbor next door. Thank your brilliant government negotiators at the US Post Office for that insanity. The only thing that might disrupt the existing dynamic is additive manufacturing. But we are nowhere near that being able to compete with mass production. I would guess you have neither traveled much nor built much. Training via remote means has existed since the first books. Computer based since the 70s that I know of personally. Yet classes still have instructors… Sales fairly obviously still benefits from personal persuasion. Management types all learn the value of personal presence. From reading body language to informal side discussions to physical site inspection. Yes, I’ve remotely managed projects and can make it work… for simple things that are well characterized… I’d guess you can get about a 25% reduction in “presence” before it hurts. Then there’s things like equipment installation, repair, and property inspection / buying. Not much can be done to reduce that, or construction travel . So don’t expect travel costs to plunge any time soon. Folks have already harvested most of what can be done as remote work. Then the idea of manufacture via nanites is going to be real any time soon or local manufacture via robots is going to take over… just silly. Major economies of scale accrue to Finance and Marketing (branding). The Big Guys can buy the same tech, but cheaper, and dominate shelf space and brand preferences. That’s why there is a McDonald’s and Starbucks on every corner, not a million different Mom & Pops. There is no significant economy of scale in restaurant operations beyond one stove and cook, yet magachains dominate outside the top level where exclusivity drives unique product. Most other manufactures have big physical economies of scale. What sorts them? Tranport costs. For centuries, transport costs have been dropping so centralized manufacturing grows. Megaships and containers now make transport so cheap as to be nearly irrelevant. Note that most oil goes to air and road transport. Ships use the cheapest leftovers ( bunker fuels ) of the refining process. For this reason, despite living where peaches are grown and canned, my local store carries canned peaches from China. Lower cost to make there and transport costs now irrelevant. Most folks do NOT want to take on the set-up, clean-up, and maintenance of DIY production. You see this in things as simple as cooking and lawn care. We are not going to be making our own shoes like granddad did, even with a robot. Just like we don’t want to mow or make sushi from scratch at home. (I’ve done both, but usually buy when possible). Heck, a home espresso machine is $50 on Amazon. I could pay for it with a half dozen displaced Starbucks visits… yet I keep buying my Mocha… If that’s the case, why would I want to make my own pots and pans at home? No, the plunging transort costs mean we buy ever more stuff from Amazon, delivered via transport, that they buy from a big global maker, with centralized economies of scale in finance, marketing, resource buying, equipment buying and operation, and management. Local retail shopping being hit, but not moving us to local making. More transport (goods from China to here and Amazon to the home) less local manufacturing. In the Port of Los Angeles, San Pedro and Long Beach they are transitioning to robotic cranes to load and unload the ships. They also have dedicated rail lines that run 75 miles inland to carry those containers to Amazon, Target, Home Depot and other Mega D.C.’s built where the land is cheap. Hell, I remember being force-fed stuff like “The Fate of the Earth”, “Entropy”, and “The Day After” (not “The Day After TOMORROW”…that was a different piece of crap) in high school back in the 80s. Ronnie had his finger on the nuclear trigger, we were running out of EVERYTHING, there were too many people. Etc. Repeat as needed. Its almost child abuse, when you think about it. You must be dreaming. Just wait for the US Middle Class to recuperate from the onslought that left them with empty wallets. When America is made Great Again, so will the consumption of energy. Just hammer this into your brain. The wealth and prosperity of a nation is determined by the amount of energy they are able to consume. Energy low, like North Korea, no lights and poverty on the level of starvation. Energy high, rich, prospoerous populations. Also read UN Agenda 21/30 and http://green-agenda.com to understand what really is going on. Absolutly no need for alternate fuels. We have for many hundreds of years coal, oil and gas available so time enough to think of real alternatives that won’t cost us an arm and an leg to no avail, Just saying. How do interest rates figure into this? The US production curves seem to see a leap coinciding with ZIRP. If interest rates weren’t articicially near zero, are the economics still such that producers would still be able to borrow the sums necessary to develop the unconventional reserves? People who use it as a prop to implement their world view will never let it go, either. Peak Oilers WANT us to run out. Peak, peak. peak. This is endless peak oil, without end! There is still oil even the “exhausted” oldest oil fields in Pennsylvania. The oil could be recovered by using a CO2 flood. And then there is even more oil after that, waiting for the right technology and price to produce it. That would only work if the carbon tax was paid to the oil companies. Peak Oilers? Does that have something to do with Connor McDavid? Peak Oil?? Is that what happened to the Huston Oilers, They peaked? From the EIA. Looks like last weeks domestic production was about 9.3million bpd. Nearly a century before Hubbert started worrying about the United States running out of oil the British economist William Stanley Jevons was worrying about Britain running out of coal. Although Britain only has a very small coal mining industry today, using open cast pits, deep coal mining did not come to an end because we ran out of coal. It ended partly because other sources of energy such as natural gas were cheaper and partly because of environmental concerns. It ran out of coal in thick enough seams at reasonable depths that you could justify the expense of mining it. The United States Geological Survey (USGS) has conducted a series of studies on the economic accessibility of coal in the major coal producing regions of the country. The studies have typically found that only a small fraction of the coal will be economically accessible at the current price of $10.47/ton. In August 2008, the USGS issued an updated assessment of coal in the Powder River Basin. After considering stripping ratios and production costs, the USGS concluded that at the time of the economic evaluation, only 6 percent of the original resource, or 10.1 billion short tons of coal, was currently economically recoverable. At a price of $60/ton, roughly half (48%) of the coal is economic to produce. Natural gas is currently around $3.00/mmbtu. Most shale plays have a break-even price of ~$3.50/mmbtu and require ~$5.50/mmbtu to generate a decent return on capital. Coal is a helluva lot more economic than most people think. Cost and environmental concerns were NOT relevant to the closure of the UK coal mining industry. Members of the British Association of Colliery Management (BACM) fulfilled the task of closing the UK coal mining industry which was imposed by the then UK government for purely political reasons. At that time UK coal was the cheapest fuel (i.e. both lowest cost and lowest price) available to UK coal-fired power stations. I was the National Vice-President of BACM. The Stone Age did not end because they ran out of stone, neither did the Iron Age. It’s either the advent of a new technology and the markets as in the end of the horse or politics as in the UK coal example. It is the latter route the water melon eco Stalinists have been pushing for some 30 years to get the industrialized democracies to forego the use of hydrocarbon energy sources – by hijacking science for socio- political ends. The production of any commodity depends on price and cost of production or profit for short. Just look at gold rush on tv. They are recovering gold that 50 years ago would be left in the ground. The ‘environmental concerns’ were primarily Global Warming, which Thatcher invented because the mining unions were run by raving lefties who’d used their power on many occasions to force the government to give in to their demands (which was one reason that British coal became more expensive than other fuels, including foreign coal). Thatcher did create the global warming scare but for much more personal reasons than those you assert. However, her political party were willing to accept (at least, to not oppose) her promotion of the global warming scare because they blamed the National Union of Mineworkers (NUM) for the collapse of the extremely incompetent Heath government, and the scare was ‘anti-coal’. I provide and explain the facts of these matters here. Who closed more pits? Thatcher or Wilson? Right, but the UK is still importing coal, exporting garbage which is burned in the Netherlands and big, big worries about the liability of the grid. Looks to me the UK desperately needs a renaissence of coal plants. Nobody will notice since modern plants hardly produce any emissions besides a little water vapor. What’s really making this whole issue pretty much irrelevant is the imminent decline of gas powered vehicles. The other day Volvo stated that it will not produce gas powered vehicles after 2018 and BMW announced their new i3 sedan, which will hit the showrooms next month as a Tesla Model 3 fighter, a car that has a waiting list of over 500,000, all putting down a $1,000 deposit and a similar $30K something list price. Also the news that automakers are in the process of creating 135 electric car models, many simply electric versions of existing gas powered models. Almost all of this is due to the current lower battery prices, and very good reason to believe they will fall even further. The fate of gas powered vehicles lies almost entirely in the hands of the price level of lithium batteries. Volvo is and will always be a bit player in the auto industry. There are about 2 billion cars in the world. 2 million are electric (0.1%). EV’s are increasing at a global rate of about 230,000 vehicles per year. That puts them on track to cross the 1% mark by 2095. Even if EV’s expanded at an annual rate of 15%, they won’t hit the 3% mark before 2040. Wake me up when EV growth ceases to be 1) linear and/or 2) insignificant. Volco has just passed the bankruptcy. If the great presidents from that large country across the Pacific were not allowed to cheat Volco, it would now be dead. Compared to the major European manufacturers VW, Mercedes-Benz, Audi, Renault, Fiat, Skoda, Volvo is a garden dwarf. But that was also before the almost broke already so. My 240 Volvo wagon will still be running long after they have gone bankrupt, due to their inability to stay with a business moldel that works. I wouldn’t mind owning a Volvo V60 D6 if they ever bring them across the pond. Volvo has made some great cars over the years. I think that they are going to suffer from this decision to move to all hybrid/EV vehicles in such a short time frame. On the other hand, Tesla is also in for a world of hurt as the competition from established automakers should crimp Musk’s high hopes to dominate the EV market in the US. You can always tell in an American film if people are ‘nice’. The scene opens with them driving a 240. This “imminent decline” is driven not so much by market forces as by regulation and taxation. If petrol was not heavily taxed, and CAGW propaganda had not turned everyone’s brain into mush, then electric cars would be irrelevant. I’m not opposed to electric cars in principle – if they work well and can be run at competitive prices, then why not. However, here in Ontario for example our heavily indebted government doles out thousands to every buyer of an electric car. This is lunacy. I’ll go electric when they produce a vehicle with 3/4 to 1 ton carry capacity and cost less than currently available Pickups/vans. Oh, and not battery dependent, got to have its own electric generator. Till then I will stick to real vehicles, not little charge up toys. That is not what Volvo stated. Volvo Cars, the premium car maker, has announced that every Volvo it launches from 2019 will have an electric motor, marking the historic end of cars that only have an internal combustion engine [ … ] Volvo Cars will introduce a portfolio of electrified cars across its model range, embracing fully electric cars, plug in hybrid cars and mild hybrid cars. Many media outlets were fooled. The Swedish car maker isn’t giving up on gasoline. It’s redefining its niche. Rv. ” Volvo Cars, the premium car maker, has announced that every Volvo it launches from 2019 will have an electric motor,”. My 2000 Buick Regal has at least 8 electric motors. My 1966 Impala SS 396 had two electric motors. I guess they could make a heater fan work with vacume motors like our 1955 ford windshield wipers did but I prefer my cars with many electric motors. None of them driving the wheels of course. I did drive my battery powered scooter 1.9 miles to work for a couple of years. Just about the time I was breaking even with saving gas , I had to buy new batterys. The scooter is for sale right now but no one is interested. It’s on it’s fourth set of batterys, about 280 dollars worth. It is my first and last electric vehicle. fans, pumps, wiper motors, window mechanisms, mirror actuators, etc. For that matter all Detroit’s vehicles adhere to Volvo’s announcement. Lets wait and see how disingenuous Volvo intends to be. I’ve got 3 laptops with dead batteries. Convinced me to never buy a car with lithium batteries…. I suspect A Lot of folks have personal experiences with battery death ending device life… and remember that when looking at cars…. Battery powered tools!!!!!! Makita, DeWalt, Black&Decker, Porter Cable, etc, definitely influenced my opinion of charged battery systems. Oh, and lets us not be forgetting CELL PHONES and their crappy assed batteries. I run my laptops on cords, majority of time, so they get a pass. Of course, most Volvo fans have a realistic view on what’s going on and they don’t like electric plug in BS no matter what Volvo states about their client base wishes. They want a tank with a reliable engine and the flexibility to go anywhere without limitations. Yes, I have a Volvo too. According to the Washington Post, the number is much less than 500,000 … With more than 370,000 pending reservations for a Model 3 — according to Tesla’s latest public figures — the company has its work cut out. The “latest” numbers (370,000) in the Washington Post article are from over a year ago. Nobody actually knows how many reservations there are for the Tesla Model 3, because they haven’t disclosed that number since last year. To put some perspective on what 370k means, Chevy sold 600k Silverado’s/224k Sierra’s in 2015, a little less at ~574k/221k for 2016. Electric cars won’t be taking over the world until they have a range of 400 miles or so (like a gas/diesel-powered car) and can be “refueled” in 5 minutes like a gas/diesel-powered car. The 400 mile range can already be accomplished with the Hybrid efficient generator. Probably the majority of Volvo sales will be Hybrids of some form. I think the headline Volvo used was a bit rich implying they were abandoning the ICE engine, but in reality it will just be a smaller more efficient ICE engine running a generator that can charge a smaller battery pack when needed. Best of both worlds. The hybrid engine runs at max efficiency while making A/C in summer or winter heat viable to heat cabin or battery pack. It also allows for a smaller battery that can still be 100% electric on shorter commuter trips, which the majority of car trips are already, but allows for longer road trips with the aux hybrid generator running. No range anxiety with this alternative to the current status quo. The plugin hybrid electric car is IMO, the best alternative to what makes practical sense, and one that already has all the infrastructure in place to accommodate. For cities like LA or Beijing with a real air pollution problem, this really makes sense. Plus it is better efficiency overall, so some savings for the consumer on fuel when in hybrid mode and electricity is fairly efficient and can be produced outside of a city by conventional current methods, alleviating a lot of the air pollution for the big city. For these reasons, I think the plugin hybrid is a winner and should be the model we turn to. Hybrids don’t make practical sense because the battery pack has to be replaced every 7 years or so. That is similar in cost to replacing a car’s gas engine, which typically last 2 to 3 times longer. The modest boost in mpg doesn’t make that extra cost worth it. My ICE vehicle takes 10 minutes to refuel but it has a range of 600 miles. 1 second per mile of range. Power large construction and farming equipment, powered from lithium batteries? Come on. Agriculture, 18% of CO2 emissions. What are we going to do stop eating? 200 mile limit for all electric vehicle? If there is no issue with AGW and if it is shown (CO2 levels will fall when the temperature falls) that only 17% of the recent rise in atmospheric CO2 is do the anthropogenic CO2, will it be necessary to force people to purchase tiny electric vehicles that have a range of 200 miles? Oh and the planet is going to abruptly cool, so the issue of AGW is going to be replaced with what the heck is happening to the sun and the climate. Correction, post 2018 Volvo will not build any vehicles that do not have an electric drive, but will continue to fit gasoline and diesel engines in the majority of them. Eg hybrids. This is exactly what the European fuel consumption targets are seeking to happen. No surprise, and certainly not evidence of the end of the internal combustion engine. There are no EU fuel consumption targets, all the BS comes from the UN. EU is totally obsolete and in desperate need to be side tracked and left to die. Uh actually, no. It depends on the development of new feasible battery technology that will make EVs as useful as petroleum fueled cars.. Battery technology is a mature industry – 150 years and counting. Any foreseeable technology increase will be marginal. Physics and available materials limits any major breakthrough. Batteries already use the optimal available element. Manufactures are already pushing the boundaries of physics – note the amount of battery fires and exploding batteries. The major breakthrough is in micro technology which require less and less power. Cell technology is made to fit this. You’re confusing straightforward market segment re-branding on Volvo’s part driven in part by the fact that it’s Chinese owned, with wishful greenie thinking. Tesla’s Hong Kong sales for June, 2017 fell to zero  after the local government canned EV subsidies. Essentially the same thing happened a couple of months ago in Denmark when the government there started imposing the same mind boggling 180% import tax [no Josephine, that’s not a typo..] on EVs as on conventional cars. Wrong. Volvo stated that no cars would be solely powered by gas. Hybrids rely on gas engines to make them economically viable. I don’t see much market for purely electric cars. Even the best have too limited a range, even in summer(much less winter) to be used more than just locally. I read one blogger taking their Tesla across country. Every leg of the journey had as much planning as a private pilot has to do for a cross country trip- travel times, traffic, charging stations, price of a charge at an unsubsidized outlet, alternate stops for every stop. Mind boggling. At this stage of the game, the best alternate is a hybrid vehicle. Unlimited range. The battery recoups a goodly fraction of all the energy spent going up hills, same for regenerative breaking, transparent battery management etc. The only downside is the inflated prices currently being charged. Evidently the car companies are trying to recoup all their development costs in the first couple of years. If BMW and Chrysler can build them as well as Toyota does there will be some real competition. One way to look at crude is the economic cost in real terms. Correction of the value of crude for inflation gives a societal cost of the commodity. In this case, crude has not changed in value significantly since the 1980’s. Using USinflationcalculator.com data from 1913 to present and august 1983 = 100 CPI, crude is now worth $20.15/bbl for Brent and slightly less for WTI. This is essentially the same price in the late 1980’s. I wanted to post a chart but I cannot copy and past into this site. Suggestions on how to paste images into a reply would be helpful. That there will come a time when there is no more oil at a price that is competitive with the alternatives is a given. When that time will come is anybody’s guess. And that’s all that people are doing. It really amazes me how emotionally committed some people are to the notion that we are about to run out of oil. Idiocracy will have occurred by then. Or is it already upon us? I don’t know, there must have been some survivors of ship B as I think I just saw one on CNN and there’s one talking on Fox News business channel right now! Peak oil is not about the amount of reserves in the ground. Its defined as the period where it takes the an uneconomical amount of energy to get one barrel of oil out of the reserve to the end user. This ratio has been narrowing down for years. – As the famous saying goes – The easy oil is gone. The current “tight and unconventional”oil is propped up by the money printing press conjuring up dollars out of thin air. Alternatitive energy can’t exist without fossil fuels. And then. You have better get used to living like Fred Flinstone. Your whole lifestyle is made up of fossil fuel derived products – plastics. Have a look around you and check how much plastic is in your lives. EROI has not been monotonically declining for Oil. It goes down and up as a dance between depletion of certain geographic resources and progress in extraction technology and infrastructure and other fruit of capital investment. The first U.S. commercial oil at 70 foot depth was not easy to extract as drilling was done by 5 men bobbing a fishtail bit up and down on a spring pole in a laborious effort that could only make 2 feet/day through rock. Oil at 1,000 feet was much easier when accessed with rotary rigs powered by steam engines driving bi-conic bits. And as we drill deeper, the oil reservoirs tend to be come larger and the oil lighter and sweeter, with higher ratios of cleaner-burning and incredibly versatile industrial feedstock natural gas. 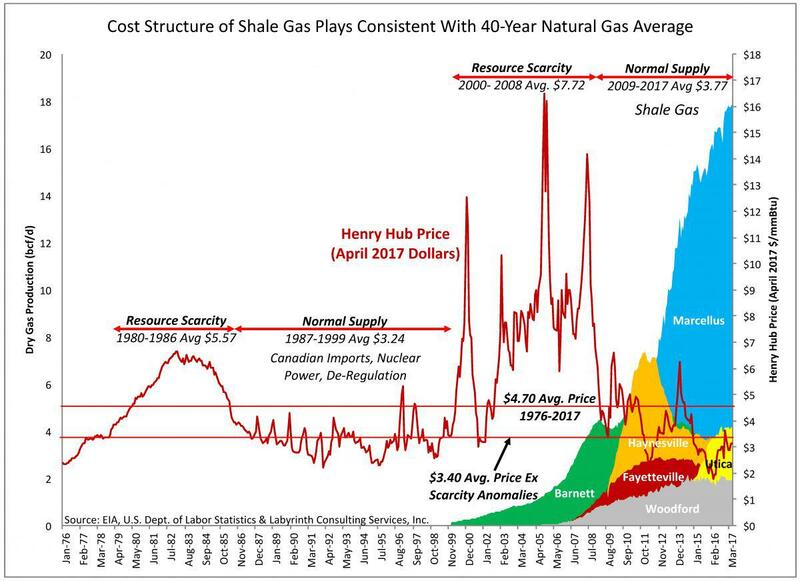 The chart many comments above that shows declining break-even prices for shale plays illustrates how the march of technology and capital investment can increase EROI even as resources become inherently more challenging. We haven’t but begun to tap global tight oil resources, let alone deepwater and sub-salt oil or methane hydrates. EROEI is just a bunch of letters to me. Our bottom line is denominated in $, not in btu or joules. The energy economy underpins the fiscal economy. EROI theory was born out of the study of biological systems (i.e., biodynamics, ecology, biophysical economics). A civilization has to consume energy and manage waste just like any living organism. It can only afford to use a fraction of today’s finished energy supply (i.e., food on the shelf), to supply the energy necessary to forage for and collect and refine a renewed supply of food for tomorrow. Humans living in agricultural civilizations with a 2:1 EROI or less essentially spend their entire day on subsistence tasks to feed themselves. First draft animals and later coal and the steam engine brought improvement to EROI, and freed up some human labor to be available for non-subsistence tasks such as education, tinkering and innovation, the arts, pure research, etc. The fruit of such bonus of “free” time is an upward spiraling of science and technology and productivity that increases the EROI of developing nations even further. Energy is the real currency that is necessary to extract raw materials from the ground and add value to them in manufacturing, and thereby increase the wealth of civilization. Energy and what it delivers is tangible wealth. Money is just an intangible denomination of wealth. Based on EROI and historical analysis, I began in 2012 predicting a coming oil & gas price collapse while the most vocal voices were calling peak oil and prices that could only continue upward. Based on EROI and historical analysis, I also predicted that we would enter a battle for market share and a period of mergers and acquisitions that would see OPEC and Russia increase production and E&P operations be gobbled up by O&G majors with refining operations to sustain them with downstream profits while the upstream side returns dried up. I also continue to predict, based on EROI and efficiency gains and elasticity of supply, that the current price of oil and gas is the new norm that will endure for a decade or more (with of course the superposition of spikes due to geopolitical events). Smart bankers and investors will look at the energy bottom line below the fiscal bottom line, because it will tell them where the fiscal economy is going to be tomorrow. Whether or not oil is a renewable resource or not, modern society will not evolve to the next “spacefaring” level of society on chemical energy, nor will we conquer the stars on solar. We have to learn to safely use the power of the atom, or society will be a failure, just sitting here waiting to die. I had a very sincere instructor in college during the first oil crisis who was absolutely sure that oil prices would never, ever, come down, and we should just get used to scarcity. The greens have the same attitude still, but keep putting the fulfillment of their prediction into the future. 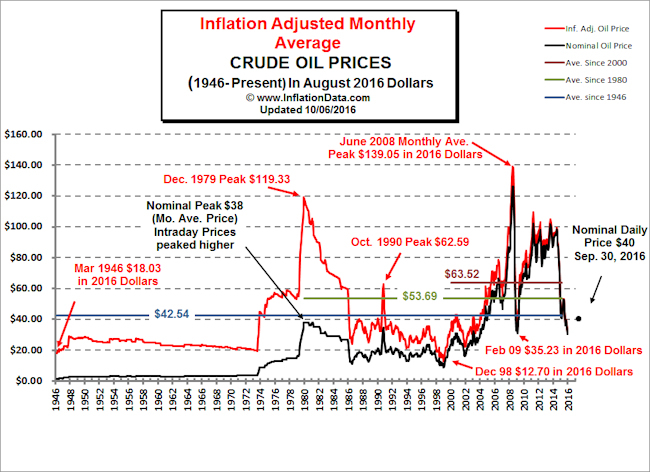 One thing I do know, is that in relative terms to inflation, oil/gasoline has never been cheaper in real terms. One of my first jobs was pumping gas in 1972, when minimum wage was about $1.25 an hour, and a gallon of gas was about .50 cents. Now minimum wage is anywhere from $8/$10 an hour, and as high as $15/hr in some places, and a gallon of gas is only $2.75, so if anything, gas prices are as low as they have ever been. Relative to inflation of course. Gasoline will be hard to replace, on a power/density scale for the price we pay. On January 3rd, 2014, when Cushing WTI was $93.66/bbl and NYMEX Brent Crude was $106.57/bbl and U.S. daily production was 7.8 MMBPD, I made an exact prediction: U.S. production would climb to a peak of 9.5 MMBPD, and this would coincide with a collapse in global oil prices to the $50-$60 per barrel range, which would be the new enduring norm. I further predicted that this would happen between summer of 2014 and summer of 2016 ( http://www.ourenergypolicy.org/should-the-crude-oil-export-ban-be-lifted/#comment-1724 ). I have not yet found another prediction that far in advance that called subsequent events more accurately. I still have a bet to collect from a peak oil. That’s an awesome prediction. Although prices did collapse to below $30/bbl in early 2016 before recovering. When will oil be back over $70/bbl? Or under $30/bbl? Personally, I think the trading range will be $45-$55 for the next year or so and then rise to $70+/bbl over the next few years as the lack of capital investment rears its ugly head. Have you read Art Berman’s explanation as to why the collapse in prices proves “Peak Oil”? It’s hilarious. I’l try to find a link to it. Art is the Godfather of Peak Oil. Peak Oil is a function of resource depletion. It’s a real thing. I’s just not a terribly relevant thing. We may have already hit peak oil or we may not hit it for 100 years or more. We won’t know we hit it until we are way past it. And it really won’t matter that much. About 10 years ago the experts were saying that we would never see oil trade under 100 per barrel in our lifetime. This time it’s different they said. It will be the new normal. I was on the kitco discussion board calling BS and being attacked for my opinion that, when the experts are making bold predictions, do the opposite and start buying cheap deep out of the money put options on oil futures. If I was forced to make a guess, I’d say that a year from now, oil will be between $30 and $100/bbl… or higher or lower. Let’s say everyone should have access to free gasoline and the government should put programs in place to ensure that this is a right for even the poorest among us. Then, where will the price go? There is a techique called creaming curves that can be applied to basins. It says that about 76% of all the oil ever to be discovered already has been. And of the worlds largest oil fields, Ghawar is 2/3 depleted and Samotlar is 85% depleted. It’s all a matter of price. The Canadian oil sands proved reserves @ 180 billion barrels continue to make money even at USD 40-45 – an idea that had many rolling in the aisles just a few years ago. In fact a significant uptick in output is coming on line in 2018. How much of that ever makes it out of the ground is a matter of price. Peak oil it is not. Creaming curves indeed apply to already discovered producing basins not to basins that have yet to be explored. So the 76% you quote is probably applicable to the former only. The (_______Insert doomsday scenario here) is approaching in 30 years. Act now or we will pass the tipping point of No Return. YOU must put us in charge to fix this. We will philanthropically act on your behalf to save you but you must contribute via your taxes, jobs and life. We can’t say what steps we will take but we are smarter than you rubes. The world will not stop consuming oil even after oil reserves have been depleted. We will turn natural gas into liquid fuel via gas-to-liquid (GTL) process. Shell has the biggest GTL plant in Qatar. When the world ran out of natural gas, we will turn coal into synthetic diesel via Fischer-Tropsch (FT) process. The Nazis did that during World War 2. So let’s sing “FUEL” with Avril Lavigne!! Along that same line of thought, I never supported recycling my beer cans. We should send them to the landfills where in the not to distant future they will make it profitable to mine the landfills for several resources including plastics. @ Joe Crawford…back in the 1970s I was living in the mountains of Northern California. My friends who were born in that area would toss their beer cans out the window when driving down the road. They used to joke that one day people would come to ‘mine’ all of the aluminum cans. I didn’t find it very funny at the time, but in the long run they were right. Almost all of those empty beer cans were cleaned up over the last several decades. When I lived in the mountains of Colorado we use to call those people who walking the roadsides picking up cans ‘Aluminum Miners’. Funny, the same people who claim to be able to accurately predict the weather in 100 years are the same ones who keep telling us there is no more oil or coal to be found. Makes me wonder how many of their grandparents insisting on continuing to make buggy whips and tallow candles well into the 20th Century. Yep, I been hearing all my life about how everything is running out and its all going to come crashing down in ruins. The only things I have seen run out or crash into ruins came to that end at the hands of academics and politicians. They are the only people who can “build” something with lies. I can’t build a house with lies, or plant crops with lies, or raise livestock with lies, etc etc, but those two groups certainly make themselves fat and rich with nothing else. Funny, that. I’m 41 years old and have been hearing about how we’ll run out of oil literally any minute all my life. Not from my parents, mind you, who are imminently practical and great critical thinkers, but from people who in one way or another are trying to sell me something. Now, I’m pretty sure there is a finite supply of oil, but there seems to be such a huge amount of it that it seems like we’ll still be using it when after my great grandchildren are gone. Yep. Although, I think the people preaching about imminently running out of oil are trying to control what you can purchase. Apart from bad ideas, they don’t really have anything to sell. Exactly. They keep trying to sell me on their ideology. And I wonder if there is any chance that oil is abiotic. I know I will be attacked for even suggesting this. Yes. It’s possible. There’s just no evidence of it and it wouldn’t be relevant if it was. This in itself speaks volumes. Where have we seen this attitude of self-righteous scorn before? Actually it would be very relevant. Just depends on re-charge vs. discharge rates. Also, depending on where it’s found, it could change the geopolitics of the world drastically. However it originally formed, oil has to be found in economic accumulations. Igneous and metamorphic rocks are rarely porous and permeable… And rarely contain crude oil. Even if oil was commonly formed inorganically… It wouldn’t alter how and where oil companies look for oil. It still has to be trapped in porous and permeable reservoirs – Sandstones, limestones, shales and other sedimentary rocks. Even the oil that’s trapped in fractured granites and other basement rocks, had to migrate through and be trapped by sedimentary rocks. The sourcing of the oil wouldn’t alter how it accumulates in economically recoverable reservoirs. If the Earth was generating oil at a rate comparable to our production, the curve would be more of a flat line. The field, one of the largest in the Gulf of Mexico, has been producing since 1972. Most large fields produce for decades. Many are now monitored with 4d seismic. If they were recharging at an economically meaningful rate, there would be some evidence of this. Many of the larger fields have been monitored with 4d for nearly 20 years. If the Earth was recharging the reservoirs at a rate comparable to production, you would “see” it on the 4d seismic… You don’t see this happening. 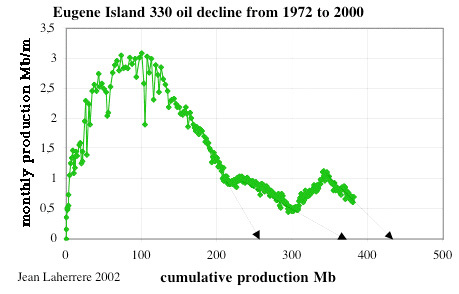 Every oil field in the world exhibits a decline curve. If fields were recharging at a rate comparable to production, there would be no decline curves. The hydrocarbons of Titan are evidence of abiogenic oil. Similarly, we know that carbonate rocks under enough heat and pressure can make methane, and that CO2 +H2 (from water) under heat and pressure (or more easily with zeolite rocks near) can make oil (FT process). So yes it is possible and yes there is evidence it is possible. There just isn’t much evidence for it happening on earth in nature. Yet. It could be (lots of oil seems to be near subduction zones, like California) but far more likely it is ancient ocean algae cooking out oil. Some algae, if nitrogen starved, make up to 50 percent oil by wt. Sunk in hypoxic traps and buried under mud is the most likely source of oil. This can also explain California (and better explains Texas). It is pretty much proven North Sea oil is an ocean trap process. Yet there are hard to explain things, like oil seeps center of the ocean where it ought not be possible and at rock depths where theory says it ought not be. But by definition, we don’t know what causes them, so can’t say if abiotic or not. Basically, nobody can prove either way, so it ends up in a shouting match. Methane isn’t oil… Not even close. Abiotic methane is massively abundant throughout the Solar System and beyond. There are no oceanic oil seeps where there isn’t sedimentary rock present. The generally accepted theory explains all of the observations. The abiotic hypothesis explains very few of the observations. There is no way to prove either theory/hypothesis. The conventional theory was derived from over 100 years of exploring for and producing oil. The theory was derived from oil exploration. We don’t explore for oil under the constraints of the theory. There’s no “shouting match.” There’s just a lot of shouting from abiotic oil aficionados who would like to believe that there is a limitless supply of oil or that the conventional theory is part of a conspiracy to prop up oil prices. Coal, the major fossil fuel, contains fossilized remnants of the plants from which it formed, many times visible with the naked eye in the form of leafs, bark, even logs, etc. In addition, it contains molecular remnants that are analogues of lignin, cellulose, etc. Coal is found in sedimentary strata. Crude oil contains bio-markers, molecular remnants of the material from which it formed also, including those that resemble fatty acids, sterols, isopreneoids, etc. Both source and reservoir formations of crude oil occur in sedimentary strata. There are many reasons to conclude that coal and oil are fossil derived. At a balmy minus 179 degrees Celsius (minus 290 degrees Fahrenheit), Titan is a far cry from Earth. Instead of water, liquid hydrocarbons in the form of methane and ethane are present on the moon’s surface, and tholins probably make up its dunes. The term “tholins”was coined by Carl Sagan in 1979 to describe the complex organic molecules at the heart of prebiotic chemistry. Cassini has mapped about 20 percent of Titan’s surface with radar. Several hundred lakes and seas have been observed, with each of several dozen estimated to contain more hydrocarbon liquid than Earth’s oil and gas reserves. The dark dunes that run along the equator contain a volume of organics several hundred times larger than Earth’s coal reserves. Since the entire ocean bottom has some amount of sediments on it, your statement amounts to a tautology and isn’t useful for finding any answers. But we are finding oil, and even asphalt “volcanoes” in unexpected places. Look, I’m NOT advocating for abiotic oil. But since we know the chemistry exists, it must be a comparative rate problem. IMHO, it is most likely that only small amounts of primative tholins or FT from rocks makes up modern oil. Inspection of oil shows biomarkers, but how much is contamination? But that is just my oppinion. We don’t have enough information to say with certainty what the abiotic rate vs life rate is, let alone was in the deep past. Sidebar: Now both sides can commence tossing rocks at me, since everyone likes to feel right and nobody is happy with “we can’t say for certain right now, but bet on biotic drillers”. Titan has methane and other simple hydrocarbons, like PAH’s. Crude oil is a mixture of complex hydrocarbons. There are no mid-ocean oil seeps where there aren’t sedimentary rocks. If oil was forming in the mantle, there should be oil seeps on the mid-Atlantic Ridge. Methane and traces of heavier simple hydrocarbons aren’t oil. Petrobras did not find oil in “rock so deep that breakdown to methane was predicted” and no one was laughing at them. It’s an interesting observation to note that the only things we’ve ever exhausted are renewable, e.g. some fisheries. It is a noble effort to continually extract as much efficiency from our use of oil. However, we are living in the Oil Age. And, we should expect mankind to consume all accessible Oil. We have the extraction and distribution infrastructure in place now, we need to leverage it while it exists. The true value of Oil is in the individual consumption. That’s why we have such an elaborate distribution infrastructure. Hoarding Oil does not establish wealth in the same way as hoarding gold. We can marvel at the engineering that has established the extraction and distribution infrastructure which makes Oil available for individual consumption. I wonder whether whales would have been hunted to extinction had it not been for the technical development of kerosene from crude oil. A Hat Tip to President Carter! “So, the solution of our energy crisis can also help us to conquer the crisis of the spirit in our country. It can rekindle our sense of unity, our confidence in the future, and give our Nation and all of us individually a new sense of purpose. What’s that saying about “even a blind hog…” ? This is the president that created the policy of not reprocessing nuke power plant waste. Reprocessing cuts the amount of waste that needs to be stored by about a factor of 10. The justification given by Carter was to make it impossible for terrorists to get their hands on reprocessed fuel. Yet, France is reprocessing their own fuel, and providing the service for other countries, and shipping it around the world. Carter’s action is a bit like someone who owns a male and female cat, and to prevent his female from getting pregnant, neuters the male cat. However, he still lets the female go outside. Jimmy Boy should have just been a peanut farmer. Carter and the Left were the only ones with a crisis of spirit. This is all very well and good, but in the good all days we used to poke the ground at the right places and oil would just come out by its own pressure. Nowadays we have to resort to breaking the rocks with high pressure hydraulic fracturing to get small streams of too light oil and making thousands of wells to get the oil that we used to get from a few wells. Or to apply a complex high energy treatment to oil sands to extract too heavy oil. Or to drill in deep oceans from expensive platforms and equipment. Along the way the cost of producing the oil has been increasing, and the energy return on energy invested decreasing. All along the number of countries that are net exporters of oil keeps reducing. Egypt, Syria, Yemen, Indonesia are no longer net exporting countries and it is common that former exporting countries are in a quite bad situation. So while oil reserves keep increasing. That is just numbers on a piece of paper. Would anyone be surprised to know that some countries are overstating their reserves? Meanwhile the trend in oil discoveries is unmistakable. The trends are all very clear, and they point towards a future peak in oil production. That earlier predictions have failed says nothing about a different final outcome. Peak oil is a question of when, not a question of if. In the “good old days,” you found oil based on surface geology… Look for a big bump on the ground with oil leaking out of it. When I started working, you found oil with a handful of 2d seismic profiles. Now, I have access to nearly continuous 3d seismic data over most of the Gulf of Mexico. A sustained low price environment in 2015 caused the large volume of negative net revisions and also reduced the annual volume of extensions to existing fields (Figure 9b). I think something to consider is that as geophysical techniques have become more powerful and readily available, the discoveries (as illustrated by Javier above) have gone down. That is, it would appear that we have reached a point of diminishing returns in exploration. As I recollect (it has been quite a few years), Hubbert based his production curve on the rate of discovery, which he sensibly used as a leading indicator. That gets no mention in your article. A basic assumption implicitly made by Hubbert was that conventional oil was the only thing economically viable, and his model was based on pooled oil from traps. An important point is that before Hubbert did his work in forecasting, few if any people gave any thought to doing things any differently to produce oil. With the Sword of Damocles (perhaps I should call that the Sword of Hubbert) hanging over the industries’ heads, the industry looked for new ways to find and produce oil. The increase in the price of oil (in part a result of oil production peaking in the US) and innovations in technology leading to ‘fracking,’ is now allowing plentiful production of hydrocarbons. However, one might legitimately consider ‘fracking’ as fundamentally the result of technological invention similar to manufacturing biofuels, or synthesizing liquid fuels from coal or natural gas. Basically, they are only feasible with the high prices provided by increasing demand and supply straining to keep up. There are no more Spindletops, and probably no more ‘Elephants’ to be found. We are busily trying to find and round up all the baby hippos! Lastly, if Hubbert’s logistic model is valid for individual fields or regions, I don’t see why it isn’t valid for a finite Earth. As with many things, a rigorous, specific definition is required before claiming that Hubbert’s methodology doesn’t apply to Earth. I think it can be a useful tool if applied appropriately. We have yet to see what the longevity is of the newly developed ‘fracking’ fields. Geophysical advances enable us to “see” and economically exploit things that we couldn’t “see” with less advanced geophysical imaging. That said, most of the really huge accumulations didn’t require advanced geophysical imaging. They were fairly obvious. And discoveries are just a small factor in reserve growth. Most of the growth comes from well performance, field extensions and economic revisions. The “rate of discovery” is not a factor in the equation. 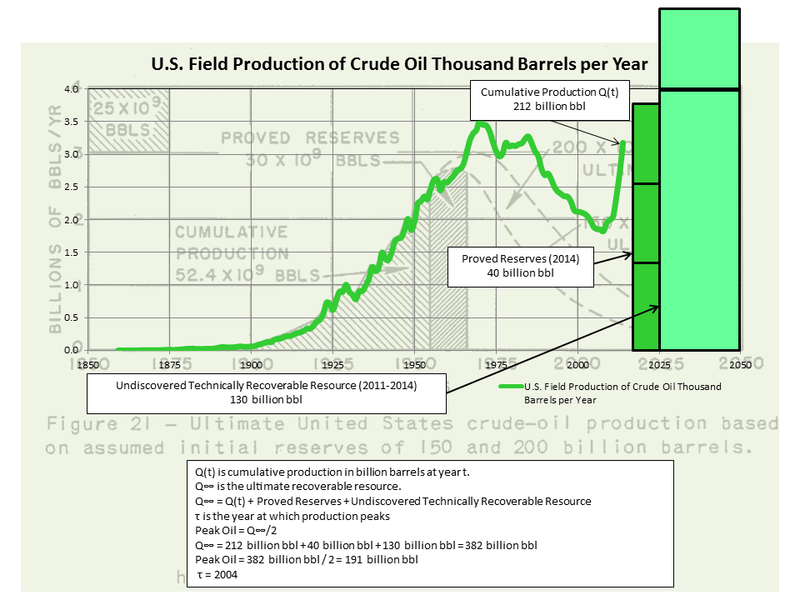 • Q(t) is cumulative production in billion barrels at year t.
• Q∞ is the ultimate recoverable resource. • P(t) = d Q/dt is production in billion barrels/year at year t.
• τ is the year at which production peaks. • ω is an inverse decay time (imaginary frequency). Basically, once you have some production history (t, Q(t), Q∞ and P(t)), you can make a reasonable calculation of τ (the year at which production peaks). Hubbert simply made an assumption of the total recoverable resource based on what was known in 1956. Had he envisioned the recovery of large volumes of oil from source rocks (shale frac’ing), he would have used a much bigger number for Q∞. It is valid. We just still don’t know what Q∞ is because it keeps getting bigger. And so long as Q∞ continues to grow, τ will remain just over the horizon. The technology innovations in fracking will bring the cost to produce in the Permian to $20 bbl. This chart doesn’t quite fit what we know, but it’s Bloomberg’s chart, so one can put a certain filter on the information it holds. I find no hint as to where the Bakken Field discovery is indicated. Whether it is in the early 1950s when first reported, or in the late ’90s when exploratory drilling started, or in the early 21st century when production started, there should be a blip indicating from 150 – 500 billion barrels (BOE). Horizontal drilling is getting additional oil out of old fields as well, not just shale. If the porosity of the sandstone is relatively low, or the drive is weak, then horizontal will get increased production. My friends in the patch tell me that they are targeting <$10/bbl as a production target. There are some really sharp people figuring out how to get viscous fluids out of the ground. The problem is that the Bakken, Eagle Ford, etc. aren’t fields per se. They are plays. Technically, they were “discovered” a long time ago. 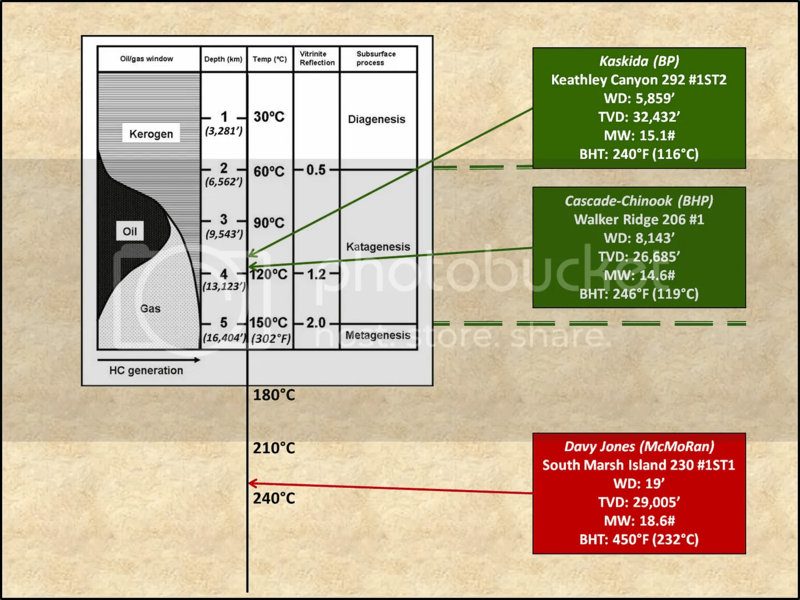 So, they would not be displayed on a chart of new field discoveries. The Permian Basin is also often referred to as a “field.” The Permian Basin is a collection of plays. 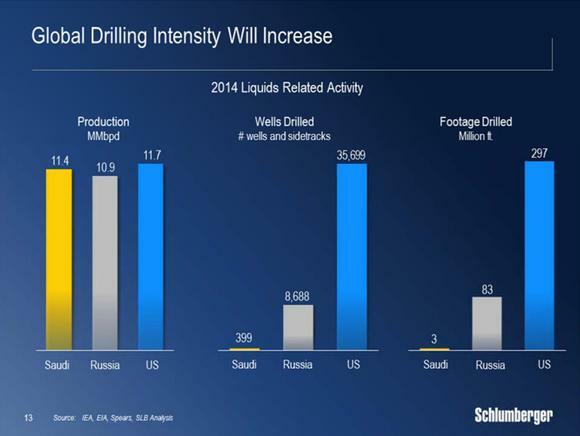 Precision directional drilling and frac’ing have dramatically increased production from these plays. Javier’s chart is probably reasonably accurate… But, like Peak Oil, it’s not all that relevant. Many of the mega-giant oil fields were literally found when people tripped over them. However, there are many areas of the word that have never been explored with modern technology. Even in the Gulf of Mexico… the Mexico side of the Gulf is just now beginning to be explored and exploited with modern technology by real oil companies. I had uncles and cousins who worked for PeMex in the ’80s and they all threw their hands up in disgust and went back to Brown&Root, Haliburton, Schlumberger and Exxon. Today’s horizontal wells do not have slow trickles of oil coming out, each well in the Bakken is now averaging over 100 bbl per day for over a year. The number of wells to develop a field has not increased, it has decreased dramatically. Before 3D seismic, a field was developed by simply drilling out the field based on suggested well spacing, and field were commonly over drilled, but now each compartment of oil is targeted with precision. Even with 3d, we still sometimes over-drill fields. That’s probably why number of wells and footage drilled are so low in the US. I distinctly remember having seen both the discovery and production curves for the US on the same graph, at some point in the past, in a discussion of the Hubbert Curve. I don’t think that it is worth my time digging through my books in my library. Even if I find what I remember, you may not have the same reference. I’m presenting this only to point out that the importance of the discovery curve is not a figment of my imagination. I provided a link to Hubbert’s paper. Hubbert would seem to be the best source on Hubbert. Proved reserves plus future discoveries at tine t plus Q(t) gives you Q∞. I agree that the best source on Hubbert is Hubbert. However, the 1956 paper is his first attempt at articulating what was, at the time, a semi-quantitative approach. Over the next several years he refined his theory and attempted to make it more quantitative. Notably, on pp. 14-15 in a 1975 paper [ https://www.osti.gov/scitech/servlets/purl/7351669/#page=6 ] he remarks, “In view of the fact that values for Q(inf) used in Figure 16 involved semi-subjective judgments, no adequate rational basis existed for showing conclusively that a figure of 200 x 10^9 bbls was a much more reliable estimate than one twice that large. This led to the search for other criteria derivable from objective, publicly available data of the petroleum industry. The data satisfying this requirement were the statistics of annual production available since 1860, and the annual estimates of provable reserves of the Proved Reserves Committee of the American Petroleum Institute, begun in 1937. From these data cumulative production from 1860 could be computed, and also cumulative proved discoveries defined as the sum of cumulative production and proved reserves after 1937.” His accompanying figures are from a 1962 paper and apparently he had not updated them. It appears that his estimates for total proved reserves are on the low side. However, it is clear, particularly from the figures, that he was using the discovery rate to help estimate the total proved reserves, which is then used in the logistic equation to predict a peak. Also, he makes it clear that the historical time lag (10-12 years) between the peak of discovery and the peak of production could be used as a sanity check on the logistic calculation. That is, he expected production to peak about a decade after the discoveries peaked. Again, this has to be viewed in the context of conventional oil that was economically recoverable. Obviously, it the price of crude oil increases, then the proved reserves increases, and the peak is moved out into the future. However, as he points out in other work, if the cost in energy for producing the resources exceeds the available energy in the product, the game is pretty much over. 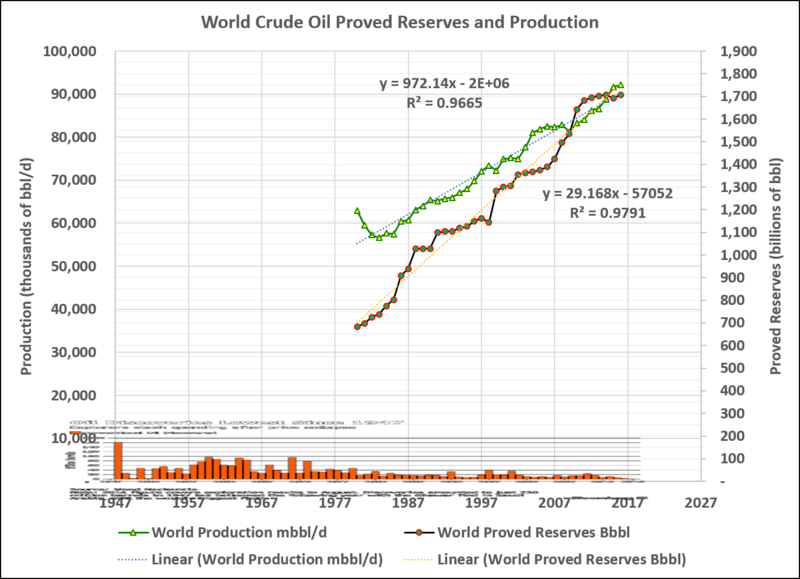 I suspect the one factor that distorts this picture is that as resources transition into reserves as the price of crude increases, the discovery curve may no longer maintain the same time lag. However, this is all in line with what one expects. That is, as demand increases along with declining discoveries, what were sub-marginal resources get pressed into production by increasing the price. The bottom line is that we can expect conventional oil to become scarcer in the mix of supplies, being replaced by unconventional oil, and the price continuing to increase. That erodes the purchasing power of the consumer and degrades the standard of living. However, it doesn’t nullify Hubbert’s insight on how discovery of conventional oil and its production are linked. I’m glad to see that you acknowledge that discovery plays a role in the calculations. Are there any Gwahars left to find David? With an estimated ultimate recovery (EUR) of 130-140 billion bbl, there is almost certainly only 1 Gawahar in the world. That said, Gawahar’s EUR was about 60 billion bbl in the 1970’s. It has produced 74 billion bbl and could produce as much 60 billion more. Except for the following: until further notice we have more known or qualified non-coal hydrocarbon reserves on Earth than anyone ever anticipated – as I hinted at above, the recoverable Canadian oil sand reserves – with technologies coming on line and of course market demand and attendant prices – could well exceed 500MMM. Demand for all hydrocarbon energy sources will continue to climb as the developing economies grow out of poverty – the idea that renewables will be able to meet this surge is delusional. Between coal and other identified hydrocarbon reserves, based on EIA estimates we have well over thousand years of reserves at today’s burn rate. It’s a matter of market price and “peak oil” it is not. We’ll have come up with something far more efficient by then – Homo Sapiens has an admirable track record of clever thinking and innovation. based on EIA estimates we have well over thousand years of reserves at today’s burn rate. The BP energy review says 50 years for oil and gas and 150 years for coal. And peak oil is also a matter of market price and economic conditions. If oil becomes unaffordable to most, less oil will be produced. A lot of people now understand that peak oil can take place from the demand side with a lot of oil still in the ground. I think there’s an issue with how “reserves” are being defined. Most people call resources reserves. BP is using “reserves” correctly. 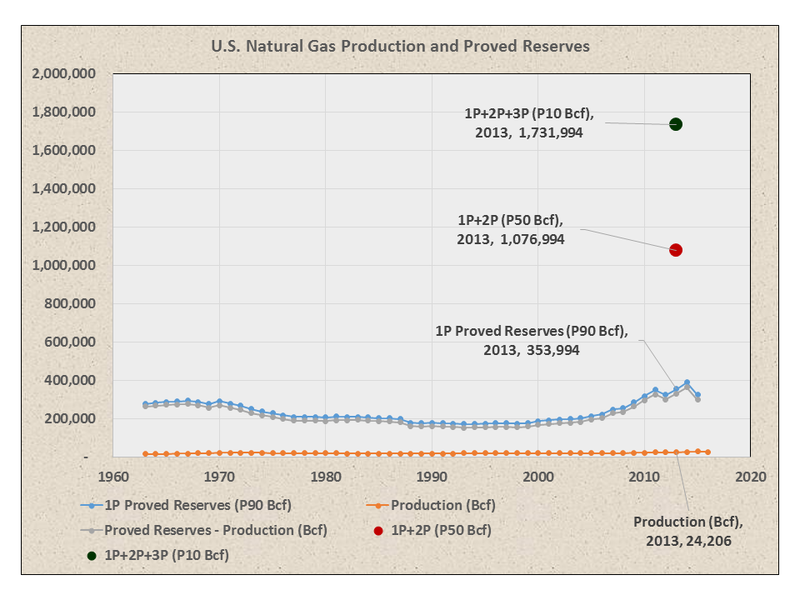 Proved reserves fluctuate mostly due to production, well performance, field extensions and economic revisions. Gas that was proved at $6/mcf might not be proved or even probable at $3/mcf. Peak oil will definitely occur when there’s a lot of oil left in the ground. It will occur when nearly half of all the oil that will ever be recovered is still in the ground. Reserve growth is primarily a function of well performance, field development & management and economics. New discoveries are a minor factor in the equation. This is largely due to the fact that proved reserves are only part of a field’s EUR (estimated ultimate recovery). Furthermore, the graph fundamentally misrepresents at least one discovery, Ghawar in 1948. When first discovered, the EUR was in the neighborhood of 60 Bbbl. It has produced over 65 Bbbl and it is estimated to have about 70 Bbbl remaining (EUR ~130 Bbbl). There were only two other large discoveries in 1948 (Romashkino Field, Russia 16-17 Bbbl and Nahr Umr Field, Iraq 6 Bbbl). The 1948 bar should be about 100 Bbbl lower than it is. Half of Ghawar EUR was recognized at its discovery. Half of it, or more, will be the result of field development. I spent much of my career sneering at development geology because is wasn’t as “exceiting” as exploration. However, almost all of the money is in field development. 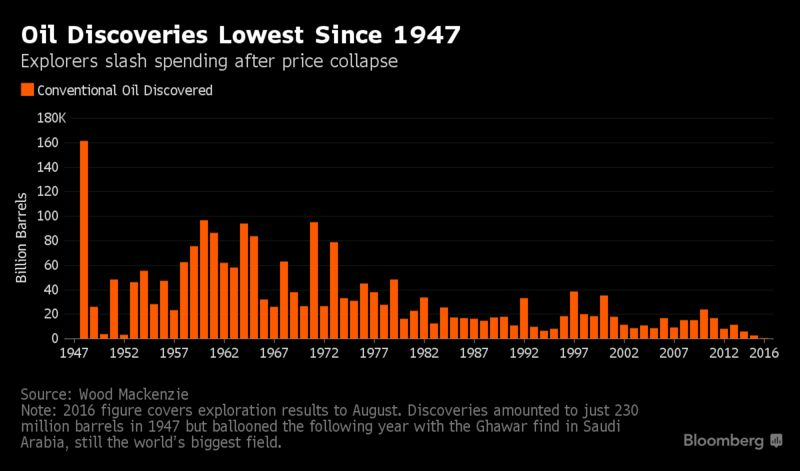 The only really significant thing about the Bloomberg graph is the fact that exploration budgets were largely zeroed out in 2015-2016. This will lead to a supply shortage and price spike somewhere down the road. Which will cause companies to pump up exploration budgets… and the cycle will continue. Why is Franklin Roosevelt’s signature on Theodore Roosevelt’s statement? Curious. “Peak Oil” is no more about the price of gasoline, diesel and Jet-A than “Global Warming” is about temperature change. Both issues are used by those with agendas of worry and change, primarily to destroy our prosperity and our liberty. Our great-great-grandparents didn’t worry about “peak whale”, because the higher price that was caused by dwindling supply was mitigated by adaption, innovation and changes in behavior. Whale oil for illuminating homes gave way to the use of oil made from coal and later from crude oil. With respect to “peak oil”, nobody buys oil to burn in their car or airplane, they buy a technical product that is made by breaking down and reassembling a feedstock of hydrocarbons that presently come from crude oil. However, should the price of crude climb higher than price of hydrocarbons found in other sources such as coal or agricultural wastes, then those sources will be used instead. The only issue is cost. This does not mean that there cannot be supply disruptions when oil suddenly jumps in cost, as it has recently. However, there is abundant documentation, such as the Barna report (Office of the Secretary of Defense, Clean Fuel Initiative ), that show we have vast supplies of convertible hydrocarbons. The only thing stopping their use is cost and government. The truth is that we are awash in hydrocarbons that can be converted to usable fuels. We even could convert sewage sludge into biodiesel. The economic truth about crude oil is that the ONLY thing that matters is the price of the finished fuel product at the pump. That price reflects how much people are willing to pay for it. At today’s price, we can afford to convert many sources of hydrocarbons into the fuels we need. It just happens that for the time being, crude oil is the most economically efficient feedstock. The instant that some other source is better, we will start making our fuels from it. ” Whale oil for illuminating homes gave way to the use of oil made from coal and later from crude oil.”, because Peak Whale increased the price of whale oil to where alternatives were more economic. We have known for a long time that gold is dissolved in sea water and have had the technological ability to extract it. The problem is that the procedure costs more than what the gold is worth! Yes, we can make oil from sewage, but the cost has to be considered. And, it isn’t just the cost in dollars. If it requires more energy to produce oil from sludge than the resulting oil contains, then the sludge isn’t a source of energy, but rather a sink! Only a liberal or socialist ignores the cost of doing something. First, realize we have unlimited energy available at prices lower than I presently pay in California ( our prices due to green requirements). Uranium from sea water is about 3x the cost from land, but at that price is still nothing in the electricity cost. The supply is functionally unlimited as more erodes into the ocean each year than is needed to run the planet. Next, realize that we run ALL Oil Refineries at a negative EROEI. WHY do we do that? Because we value the form of the energy, as FUELS, more than the energy content. So long long after oil extraction is energy negative, or oil from sewage is energy negative, we will be ready, willing, and able to make gasoline and Diesel out of it, using nuclear driven pumps. Nuclear electricity (from Palo Verde in Arizona) comes to California. Some of it flows to the electric oil well pumps and refineries. We are already doing it… nothing prevents doing more. Oh, and there are companies that have turned solid trash waste and poulty waste into oil at a profit, when oil was over $100/bbl. That tech is well characterized and ready, IF oil ever gets expensive again. Frankly, the whole negative energy return on energy investment canard is just dumb. 100% of farming and manufactures is negative EROEI. But we don’t want to eat oil or wear it, we want the form of the products to be food and clothing… similarly, hydrocarbon motor fuels work better than batteries. Making them at negative EROEI from other energy sources just says they are a manufactured product in compliance with the laws of thermo and entropy… like absolutely everything else. Only willingness to do it stands in front of making funtionally unlimited gasoline and Diesel equivalents at prces only a dollar or two above present prices by way of nuclear process heat and electricity. Even using oil lifted at negative EROEI from poor fields. Or garbage. Or lawn clippings for that matter. EM, good points. Further, using heat from nuclear power to pyrolyze natural gas would produce carbon and hydrogen, no CO2. Wouldn’t they be destroyiong their own as well? The really rich will just setup little Kingdoms, where they of course are King. Truth, well spoken. We use pure hydrocarbon liquid fuels, not because they come from oil, but because they are at the top of the pyramid for energy density, power density, ease and safety of handling, shelf-life in storage, and tailorability. The ultimate option, should the price of natural petroleum or gas become to dear, is to synthesize our liquid hydrocarbons from sea water and atmospheric CO2 using massive amounts of electricity from hydro and nuclear power plants. Human civilization will eventually embrace nuclear power in a big way as Hubbert predicted — fission, fusion, LENR — but, until there are nuclear batteries that rival the energy and power densities of jet and rocket engines, there will be a need for liquid hydrocarbon fuels. All that we know with certainty is that carbon-based resources are finitely available and accessible in time and space, which is further limited by constraints imposed by the limited causal and perceptive ability of human beings. It begins with a thought, a dream, a semi-intellectual conception. Now we wait for the Goreballistic Greens. There! I put some alliteration in the mix. Carbon based fuels – oil, gas, coal are limited in supply. Very broadly the low hanging fruits have been largely consumed. New sources will generally cost more to extract and the price will increase. Fortunately mankind has developed a number of alternative energy sources although currently they mostly need government subsidy against current energy costs, and energy storage for wind and PV is an issue. control heat and cold without recourse to external energy sources etc. The only question in my mind is when. Others have said it; we’ll (our progeny) move onto something better before too long, i.e. we will not run out of fossil fuels. There is enough coal in reserves to last over 200 years, for example at today’s rates of consumption. I remember about 25 years ago that it was “settled science” in the geological community that it would be geologically impossible to have significant hydrocarbon deposits in water depths greater than 1000 feet. And now there are developments up to 10,000 feet water depth. We keep finding recoverable oil where we previously thought it couldn’t exist or if it existed, couldn’t be recovered. No. It was never “’settled science’ in the geological community that it would be geologically impossible to have significant hydrocarbon deposits in water depths greater than 1000 feet.” 25 years ago, it was unclear as to whether or not oil could be economically recovered from water depths beyond the shelf edge. This was an engineering and economics issue. In the Gulf of Mexico, it was once thought that there were no reservoir-quality sandstones older than the Plio-Pleistocene beyond the continental shelf edge. This turned out to be very wrong. Otherwise, yep. We continuously find and recover oil from places we previously didn’t think we could. Wallace Pratt was very prescient. David what would guess is the highest barrel price the average motorist could afford? There’s a difference between geology and engineering. A geologist can tell you what something is and where it is. An engineer tells you how to get it. If Theodore said it, why did Franklin sign it? Interesting as always, sarcasm is welcome (and I don’t even like Ghostbusters). I’d like to take you a bit beyond the topic, as I would try to do if we had a chance to have a beer together. You address EVs in the comments: what about converting our transportation industries to LNG? I think you have suggested that there may be truly vast reserves of methane, it is likely to have abiotic sources, etc. Is there a future for self-driving vehicles, allowing people the freedom to stay out of transit vehicles, burning natural gas? I guess there would be a chorus of environmental snowflakes in the background, moaning and wailing. A self-driving vehicle with Lazy-boy seats and a bar would be very appealing to me… Especially if it was LNG or CNG-powered. I'm not a big Art Berman fan; but I think he gets this one right. If your going to go, you can’t beat doing it in a Lazy-Boy. One can also use The Mobile Oil process to turn natural gas into gasoline using zeolite catalysts as was trialed in New Zealand during higher gas prices. Shell turns 1.6 bcf/d of gas into 140,000 bbl/d of petroleum liquids at their Pearl GTL plant in Qatar. At $50/bbl the economics aren’t great, even though the gas is free. It reminds me of the peak food scare that we wouldn’t have enough food to feed the vast population of today. Those scientists didn’t calculate for increases in technology or for the higher levels of CO2, also benefiting crop growth. There are the known unknowns and the unknown unknowns. The devil is in the detail of the unknown unknowns. And yet we are turning food sources (sugar cane, corn, soy oil, palm oil, even wheat) into transportation fuels. Right, but the mandatory burning of food crops is done in support of a political doctrine, just look what triggered the Arab Spring Revolution, It started with protests against the price of bread in Tunesia and Egypt. Another mandate is the 30% biofeed in coal plants, Total madness to burn Georgia’s swamp forrests in EU coal plants. The time has come to stop this madness. In an economic sense there are infinite carbon-based resources available for extraction; unless one has infinite money available to pay for the extraction. What is not well known is that there are three P’s. Proven Possible and Probable. Of the three, Probable has the greater volume. When an oil field is abandoned there are upwards of 50% of the reserves left behind as unrecoverable. These are reserves are uneconomic to recover because of low production or high water cut, etc. Raise the price of oil and Probable reserves move to the Possible and Proven reserves. Reduce the field spacing from 40 acres to 5 acres and the Probable reserves move to Possible and Proven. It just takes money. In the case of shale oil reserves, lots of oil is left behind because shale oil cannot (presently) be efficiently produced due to the extremely low permeability of the rock. This rock cannot be water flooded, CO2 flooded or fire flooded. But something will come along. As the price for oil goes up, Probable reserves move to Proven and people adjust their driving habits to accommodate the new price, slowing the transition. Someday someone may invent a battery that is safe, small, able to charge quickly, holds enough power to drive a car a significant distance and affordable. When that day comes we may see Peak Oil. The problem with Hubberts Peak Oil is that it trys to isolate the oil production from the lower 48 without factoring in any oil production influences from outside the lower US. It is a bad representation of what the truth really is. If the lower 48 oil production had been kept in isolation from outside production, we would may still not have seen peak oil. Peak Oil is only going to happen when there is a price point where an economic substitue energy source is available that feeds our need to get in our cars and go. This could come from a battery or from a new oil discovery in far far away land. 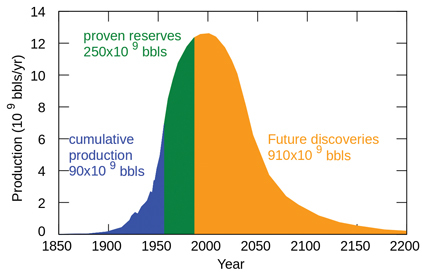 Even then, our Probable reserves of oil would be greater than 50% of what originally existed in the ground. It’s Possible>Probable>Proved… Otherwise, spot on. I’m getting old. Been a few years since I was involved. Thanks for the correction. We are not going to run out of ‘natural’ gas and we are not going to run out of petroleum liquids. The Nobel Prize winning astrophysics Thomas Gold’s book (William: Highly recommended) the Deep Hot Biosphere provides more than 50 logical pillars based on observations (I can provide an additional 20 logical pillars) which support the assertion that deep core super high-pressure liquid CH4 (CH4 is extruded from the earth’s core as it solidifies, the super high pressure liquid extruded CH4 continually breaks/flows through the mantel and is hence the origin (non-biological, primeval origin), for petroleum, natural gas, black coal, CO2 in the earth’s atmosphere, and the earth’s oceans (the earth’s ocean are saturated with CH4). Organic metals form in the very, very, high pressure liquid CH4. This enables the super high pressure liquid CH4 to pick up, transport, and concentration specific heavy metals such as gold, uranium, thorium, iron, mercury and so on which explains why there are heavy metals in crude oil and why there are heavy metals in black coal. The organic metals which form in the very, very, high pressure liquid CH4 drop out at specific pressures. The forced movement of the super high-pressure liquid CH4 from the core of the planet to the crust and the drop out of the organic metals at specific pressures explains why there is heavy metal concentration in the crust of, in some cases, a million times more than the mantel. One of the competing theories for the concentration of heavy metals in the earth’s crust is movement of water. There is however nothing to force the movement of water through thousands of miles of the mantel. A basic back of the envelop calculation based on the amount of metal that will dissolve in water (at high temperatures) indicates there is no possibility that water motion through the crust would cause the observed super concentration of heavy metals in the crust. The super high pressure CH4 that is extruded from the core of the earth as it solidifies, provides the force that separates and moves the ocean floors, driving the ocean floor underneath the continental crust. The CH4 in the ocean crust is left under the continental crust which explains why there are bands of mountain ranges at the edge of the continents and why there are massive gas deposits/liquid petroleum at the edge of continents, in mountain ranges, and immediately offshore of continents. The competing theory to the deep core CH4 for the origin of the earth’s oceans, natural gas, petroleum, and so on is the late veneer theory. The Mars sized object that struck the earth roughly 200 million after the earth’s formation stripped of most of the light gases from the mantel and most of the early atmosphere. The late veneer theory hypothesis that a late bombardment of special comets (the special comets must have less noble gases in them to explain why the earth’s atmosphere noble gas concentration does not match that of comets. There are a half dozen observations that cannot be explained by the late veneer theory. The deep earth CH4 explains why the Earth’s Tectonic plate speed has doubled in the last 2 billion years. The planet’s inner heat powers plate tectonics. (William: This statement is incorrect. Super high-pressure liquid CH4 extruded from the earth’s core as it solidifies – solidification of the liquid core began roughly a billion years ago – powers tectonic plate motion and explains the formation of mountains not convection motion). 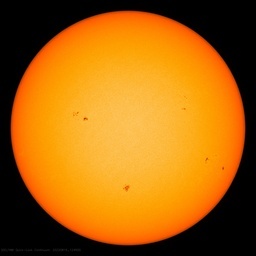 That heat is ebbing away as Earth ages, and this was expected to slow plate motion. A study last year by Martin Van Kranendonk at the University of New South Wales in Sydney, Australia, and colleagues measured elements concentrated by tectonic action in 3200 rocks from around the world, and concluded that plate motion has been slowing for 1.2 billion years. Now Kent Condie, a geochemist at the New Mexico Institute of Mining and Technology in Socorro and his colleagues have used a different approach and concluded that tectonic activity is increasing. They looked at how often new mountain belts form when tectonic plates collide with one another. They then combined these measurements with magnetic data from volcanic rocks to work out at which latitude the rocks formed and how quickly the continents had moved. Both techniques showed plate motion has accelerated. The average rate of continental collisions, and the average speed with which the continents change latitude, has doubled over the last 2 billion years (Precambrian Research, doi.org/vbv). Condie thinks the mantle’s huge store of water could explain the finding (Nope. Movement of super high pressure liquid CH4 which also explains a couple of dozen what moves plate tectonic theory anomalies and paradoxes, convection motion does not explain the observations). When crust sinks back into the mantle, oceanic water gets sucked down too, and although most comes back to the surface in volcanic emissions, over the aeons the store of water in the mantle has grown vast. The super high pressure extruded core extruded CH4 explains an astonishing long list of anomalies and paradoxes that the convection motion cannot explain. The lack of mechanism to move tectonic plates is one of the reason it took 25 years for the plate tectonic theory to get acceptance from the geological community. The following is a summary of the some of the tectonic plate movement anomalies and paradoxes. P.S. There is a low hanging fruit Nobel prize to connect the dots. This is an interesting summary of the some the anomalies and paradoxes concerning how to explain why and how the tectonic plates have moved and what mechanism creates mountains. The driving force of plate movements was initially claimed to be mantle-deep convection currents welling up beneath midocean ridges, with downwelling occurring beneath ocean trenches. Since the existence of layering in the mantle was considered to render whole-mantle convection unlikely, two-layer convection models were also proposed. Jeffreys (1974) argued that convection cannot take place because it is a self-damping process, as described by the Lomnitz law. Plate tectonicists expected seismic tomography to provide clear evidence of a well-organized convection-cell pattern, but it has actually provided strong evidence against the existence of large, plate-propelling convection cells in the upper mantle (Anderson, Tanimoto, and Zhang, 1992). Many geologists now think that mantle convection is a result of plate motion rather than its cause, and that it is shallow rather than mantle deep (McGeary and Plummer, 1998). The favored plate-driving mechanisms at present are “ridge-push” and “slab-pull,” though their adequacy is very much in doubt. Slab-pull is believed to be the dominant mechanism, and refers to the gravitational subsidence of subducted slabs. However, it will not work for plates that are largely continental, or that have leading edges that are continental, because continental crust cannot be bodily subducted due to its low density, and it seems utterly unrealistic to imagine that ridge-push from the Mid-Atlantic Ridge alone could move the 120°-wide Eurasian plate (Lowman, 1986). Moreover, evidence for the long-term weakness of large rock masses casts doubt on the idea that edge forces can be transmitted from one margin of a “plate” to its interior or opposite margin (Keith, 1993). Plate boundaries are identified and defined mainly on the basis of earthquake and volcanic activity. The close correspondence between plate edges and belts of earthquakes and volcanoes is therefore to be expected and can hardly be regarded as one of the “successes” of plate tectonics (McGeary and Plummer, 1998). Moreover, the simple pattern of earthquakes around the Pacific Basin on which plate-tectonics models have hitherto been based has been seriously undermined by more recent studies showing a surprisingly large number of earthquakes in deep-sea regions previously thought to be aseismic (Storetvedt, 1997). Another major problem is that several “plate boundaries” are purely theoretical and appear to be nonexistent, including the northwest Pacific boundary of the Pacific, North American, and Eurasian plates, the southern boundary of the Philippine plate, part of the southern boundary of the Pacific plate, and most of the northern and southern boundaries of the South American plate (Stanley, 1989). Does this theory explain why fossils are found in coal? Thomas Gold’s abiotic theory has so many holes that no amount of Flex-Seal can keep it afloat. Brandolini’s law applies here- no matter how much you try to reason with a pro-Gold follower you are met with a fire-hose of “information”. And the Russians/Ukrainians think the same about the biotic theory. Yes, and metals in coal and oil are highly dependent on local geology. If there were some source of super high pressure liquid methane source from deep within the earth, then one would expect more uniformity of metal concentrations, just another hole. Special comets are not the only candidate for the veneer theory, there is increasing evidence that asteroids provided water, along with a very different mixture of other elements than what is present in comets. In addition, there is also evidence that much of the Earth’s current water was present as the planet formed, and not ejected by the impact. No single theory explains the deuterium ratios and chemical composition for Earth, but comets, asteroids, and accretion are not mutually exclusive theories. Plate tectonics is largely developed from empirical evidence and many of the criticisms that have been directed toward plate tectonics are falsified empirically. I have for example a hand specimen of a fold in a massive body of slate. The fold can be traced for hundreds of feet vertically and miles linearly. The slate foliation persists to within inches of the fold before recrystallization erases it. In fact any smooth, unfaulted fold in rock that was crystalline before the folding falsifies the “rigidity” criticism. The real question is how faults can occur at all if rock is really capable of such folds. Rock, even near the surface where it ought to be coldest and least plastic, is evidently not as “rigid” as critics insist. In fact, critics of PT resort to mathematical models, computer models and thought “experiments” in order to explain what they think is wrong with PT, but very few critics offer alternatives. One of the chief “alternatives” even attempts to deal with empirical phenomena that PT handles cleanly argues that the the earth is expanding in size. The continents don’t move; the entire planet is growing! Either way we look at it. Our use of oil (to date) is less than a blink of the Earths eye in the scale of things. Same for yellow cake. When both are well and truly gone, the grip of the next ice age will set upon mankind. Many billions will die in turf wars for energy and fertile land..
We have in hand and proven all the technologies needed to get functionally unlimited uranium from the oceans and use it to make electricity and motor fuels at prices only slightly higher than today / historical (depending on where you live. I’m in California, so about equal to what I pay now). Goes into it. We need never run out of energy nor motor fuels. A prediction that cannot be proved. If Hillary had won, peak oil would have been last year. Regulations, restrictions, declaring vast areas off limits to exploration. “The War on Coal” would have just been 1st gear. Truth be told, the long term price of carbon-based fuels may well be up. Quite believable. But that is not a valid reason for new laws to make the price go up today. Peak oil is at least a millennium away. That is because coal can be converted to crude oil quite easily. Several industrial operations in South Africa and China already do this at very large scale. Under the North Sea alone there is thought to be as much as 23 trillion tonnes of coal. Trillion, not billion. That is about 3,000 years of world coal consumption at the current rate. Plenty there to convert into oil, and agriculture will love the extra CO2. There definitely is no shortage of carbon for the foreseeable future. Gee… and as the next ice age glacial lowers sea level, it gets easier to mine… Nice, that. Take an elevator to the new Thames Frost Fairs. The odds are that some other energy source will economically replace oil before we need to mine North Sea coal for synthetic petroleum. I am impressed by the breadth and depth of knowledge concerning oil. My view as an unrepentant consumer of the fuel byproduct is purely financially based. I remember well the early 70s gasoline fake squeeze plus all the ups and downs in prices since the late 1950s to present. Oil and the price per gallon of gasoline is a fact of life for me. So much so that I consider it a minor addiction. The solution came to me over time as I matured and realized that I could be a partial owner of the production. On the basis that Exxon and Chevron will outlive me pushed me forward. So now a portion of my net worth is based on shares of one or the other from time to time. Both pay a nice dividend. In my view the dividend more than offsets my gas pump expenditure. So I don’t sweat the price swings of gas. I expect this situation to continue for as long as I live and probably a good deal further. With nimble trading one can capture both dividends each quarter effectively doubling the expected return. I believe these companies are planning to process crude for decades into the future. I’m days away from turning 70, so that works fine for me. So in point of fact – Big Oil pays me and I like it. Peak anything is always about anti capitalists gathering to an imagined vacuum, in order to abhor it. Thereby they get a fleeting opportunity to gain power, come up with an alternative resource, and save the world. Have we reached peak academia yet? Peak Government always comes just after economic collapse…. I remember a university seminar held at Queensland Uni around 1975. Various scary figures were bandied around about the scarcity of coal. A Queensland gov’t minister said “But that’s crazy, that would mean we will run out of coal by 1995.” “That’s what we’re trying to tell you!” the organiser said. Laughter erupted, the minister’s face went red. But Qld did not run out of coal. I have recently sighted the coal map of Qld made by one of the major coal miners. Half the state has coal underneath. Malthusian predictions are 100% consistent… They have all been wrong. I’ve often thought that all this confusion about how much oil is left in the earth for our use stems from misunderstanding what Proved Reserves actually are. 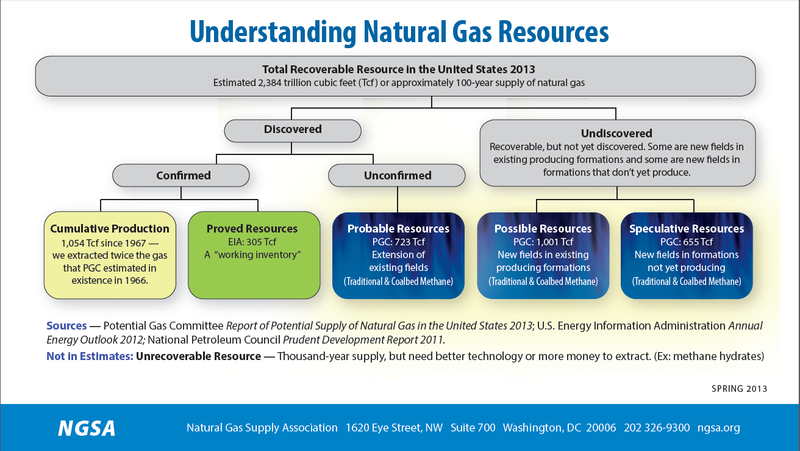 I think the public may confuse proved reserves with remaining oil, not understanding that proving up reserves for an resource company is an expensive task; one you do not embark on for reserves that are uneconomic or for reserves you do not perceive a need or an ability to exploit within a reasonable time frame. So any time the price of a resource rises, the public is surprised when reserves begin to grow. Peak Oil proponents like those predicting the end of the world will eventually be proven correct. Like you stated… it is irrelevant. There is a huge problem with the ‘shale miracle proves Hubbert wrong’ story. The simple fact is that most unconventional production is not economically profitable. If we look at the ‘best’ formation in the United States we find that the companies that have operated in the Bakken have been free cash flow negative and that cannot change given where we are on the production curve. The argument that shale or other unconventional production will mean that there is no peak production is based on a myth that is clear to anyone who has actually looked at the accounting numbers. Right now, what we have is a narrative that helps those in the industry keep the party going for as long as they can. The conference calls are clear as management talks about funding gaps that will be filled by borrowing, the issuance of stock, or asset sales. Companies that used to be touted as trailblazers show negative shareholder equity. And the average yield per well keeps falling to disturbingly low levels at a time when producers are hedged and cannot take advantage of price increases out of existing wells even as the new wells, which are further and further away from the productive core areas, show much lower productivity. I find it ironic that the very people who look at the reported temperature trends and point to the fact that the data is being manipulated don’t even bother to look at the actual data that shows that unconventional production is not economic or that conventional production peaked a decade ago. The shale “revolution” only further proves that Hubbert’s underlying assumptions about the total recoverable resource were wrong. His equations and methodology remain unscathed. Peak Oil will have occurred roughly when half the total recoverable resource has been produced. That article is about the top scientists of the day worrying about losing their most important energy source – coal. Not surprisingly, the same “solutions” as are offered to day were being offered back then. So today’s greenies are relying on 100+ year old solutions that failed then and have failed now. Thomas Edison said not to worry about it because the Amazon watershed held enough wood to power the world for 50,000 years. That’s enough to break a greeney’s heart I imagine. Only one of them got it right. Rear Admiral R. B. Bradford said that man’s ingenuity would solve the problem. And so it did with the harnessing of the energy in petrochemicals. As a species we have progressed from using animals to coal to petrochemicals to nuclear energy. What’s next? Considering the state of physics today, it wouldn’t surprise me if we could eventually harness gravity to produce our electricity. Gravity is, in fact, what actually powers hydroelectric electricity production. And all other industrial scale electrical production, regardless of the power source use essentially the same methodology – evaporate water to steam, spin a turbine to produce electricity, condense the steam back to water, and repeat. The author, along with most petroleum engineers, assert that there is so far no evidence for abiotic oil. 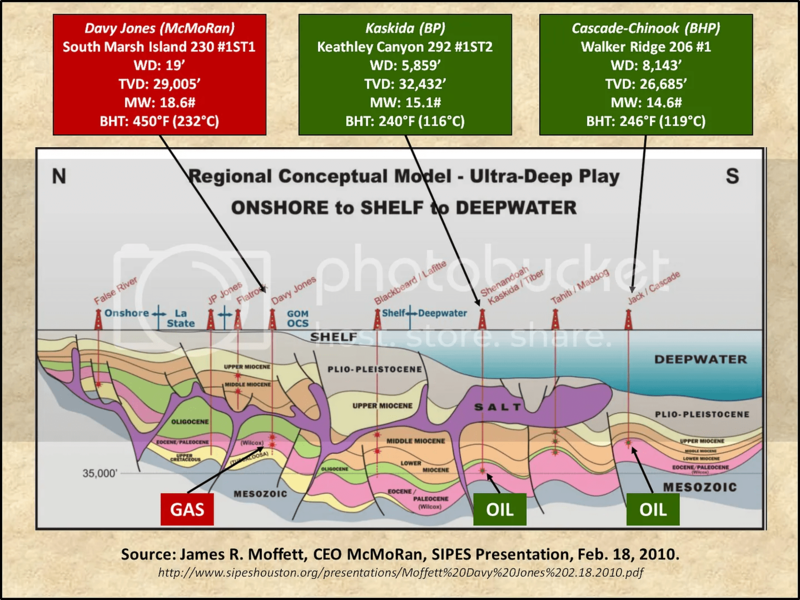 Thomas Gold made an argument for the existence of very deep oil, but his theory of how it originated was pretty far out. I have no credentials in that area, but the accepted theories seem to ofter no explanation of how “dinosaur juice” could have migrated downward to thousands of feet below offshore bottom of oceans. It would be very interesting if someone with expertise would post an explanation on WUWT. Oil does not come “dinosaur juice.” This has never been part of the theory. Gold simply lied about what the conventional theory is and then constructed a straw man argument against his own lie.